Fierce Focus: How Zentangle Helps My Business Grow - Minette Riordan, Ph.D. I am on vacation in Nova Scotia, about half way through my three weeks stay. I am working some while I am here; just enough to keep things moving and not feel buried when I return to Santa Barbara. One of the best things about being at our cottages in Petite Riviere is that I have a lot of down time. There is no television, there are no stores or shops or restaurants. Our cottage is right on the beach, it’s gorgeous. I always make lots of art while I am here, and I love having extra time to devote to my Zentangle® practice. Prior to traveling to Nova Scotia with this grandparents, my son spent 5 weeks in Vancouver working in his uncle’s machine shop. 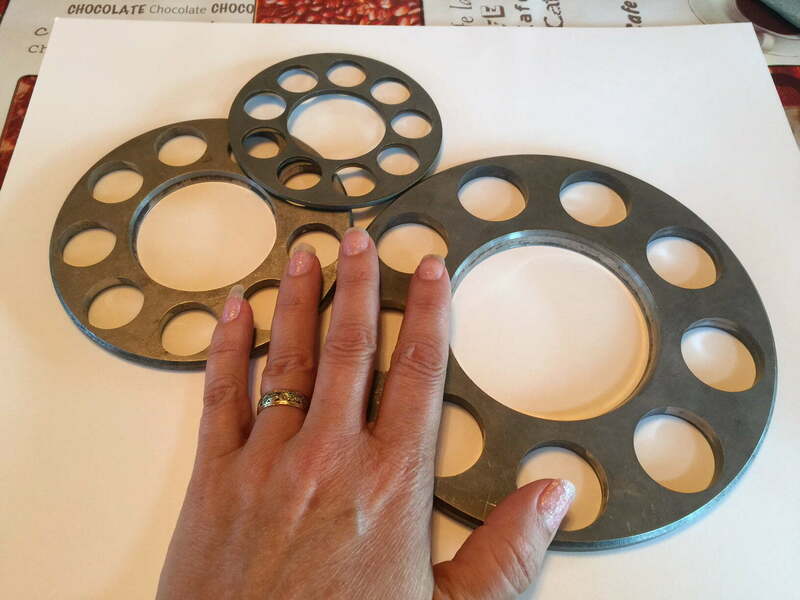 He brought me these cool metal parts, knowing that I would enjoy using them as templates for the Zendalas that I love to create. The image at the top began with these three metal discs. While I am here, I am also dreaming, researching and brainstorming ideas for my next book which will be on time management strategies for creative entrepreneurs. As part of my research, I have been reading a wonderful collection of articles called Manage Your Day to Day: Build Your Routine, Find your Focus & Sharpen Your Creative Mind. There is a common theme among the articles on the power of focus, mindfulness and dedicating time to becoming an expert. One of my favorite articles talked about how we should allow ourselves time for mindful tasks, the creative ones that take fierce focus like writing, building, planning, etc. and the mindless ones like checking email, paying bills or doing dishes. For me, Zentangle® is equal parts mindful and mindless. It keeps my hands busy and while my mind is fiercely focused on the patterns, the lines, and the colors it is also free to just be. I am not chasing thoughts and ideas, instead they just gently float to the surface where I can acknowledge them, take note and if necessary pause to write them down. I realized that when I am at home, I often tangle with other distractions around me like television or Netflix. While here, I just tangle. My only distractions are conversations with family, the waves and the seagulls fighting over crabs. I am more present with my art and with myself. These moments remind me that my business, like the meditative drawing practice Zentangle®, requires fierce focus: dedicated time and attention to the creative work. I often allow my days and weeks to become overly cluttered with meetings, calls with friends and busy work when what I am longing for right now is space to create, to redesign the content and organization of my group coaching program “The Path to Profit,” time to write my book and to blog more, to create more resources for my private coaching clients and to just dream about what’s possible. Email and social media can be equally distracting and necessary to my business but are mindless activities that take me away from the real work that I need to do. Tangling reminds me to pull back to the center, to block out time and mindful space for the art of my work. Without the creative time for designing new content, planning for the next quarter or focusing on my numbers, I can’t grow my business. As I think about the content for my new book on time management, this is what is on my mind: fierce focus, fierce commitment to my own success and fierce commitment to carving out the time for creative pursuits. Why fierce? Because it takes mama bear energy to create clear boundaries and stake a claim for the time that I need! What helps you to create fierce focus in your business? I soooo enjoyed reading your blog post Minette ! Yay! Just what I needed to hear. Your vacation and Zentangle practice sounds amazing and just beautiful. Hi Nadia, glad this post hit home for you today! Just about everything has become a distraction – from social media to email to my phone to well, everything. I’m dialing down for an extended period to regroup and recharge. I’m spending this down time to write, color, practice mindfulness, and train. I hope you enjoy the rest of your vacation in Nova Scotia. Not too far from me 🙂 I’ve been there once and it’s so beautiful. Your Zentangle art is exquisite! Thanks Peggy! I am having a great time although it is flying by too quickly. And I agree that just about everything has become a distraction. I love coloring, and I love Zen Tangles. I go to it quite often throughout the day. Thanks for a great article. Thanks for taking time to read and comment Leigh. I love Zentangle! I did a workshop a while back and loved it. So creative and restorative. Beautiful art you’ve made! Thanks for introducing me to Zentangle…I had never heard of it! You are very creative. I envy your vacation and need one of those with no phone, computer, TV. While I enjoy them, they are all too distracting to practicing mindfulness. FYI-I have family in Truro, NS! You are welcome, Tae. It’s important to have ways to find the quiet in the middle of our busy lives! 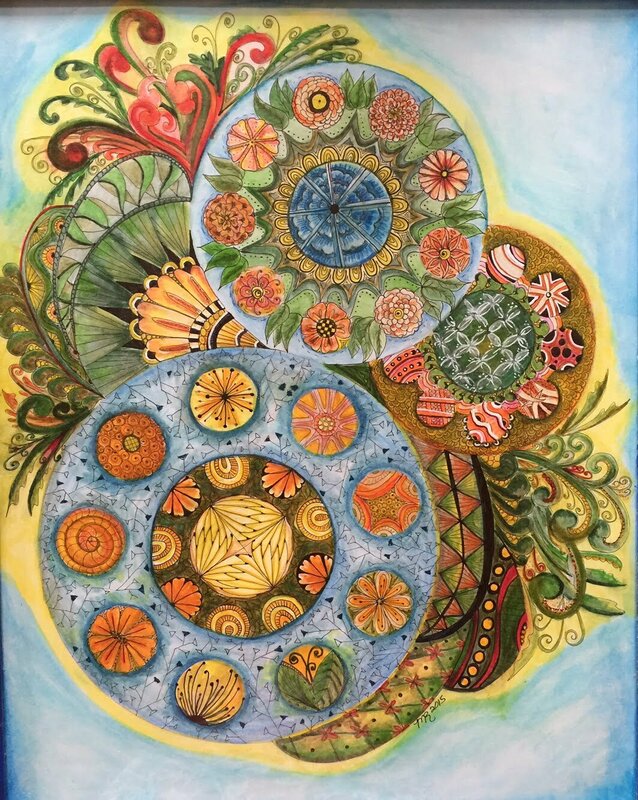 Lisa, I love using tangle patterns to create mandalas. 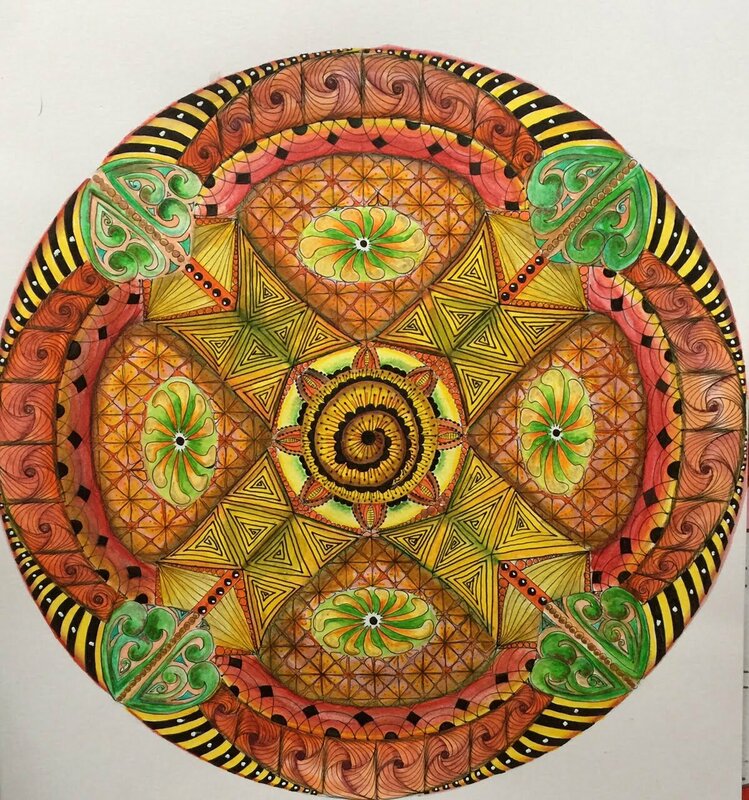 I have been drawing/coloring mandalas for years!! Hi Minette. Love your article. 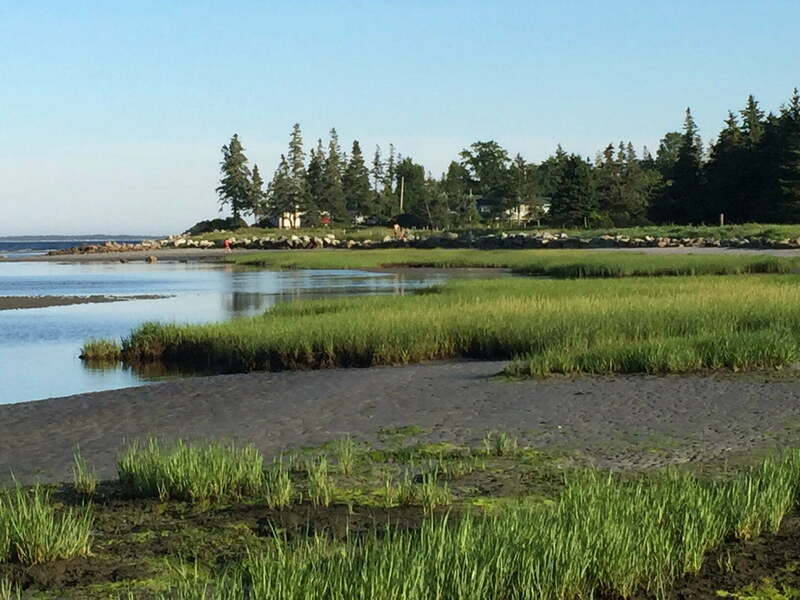 Nova Scotia most certainly is a great place to get away from all the daily distractions. Nature has magical powers when it comes to creating and focusing. Enjoy the rest of your stay. Thanks, Josee, nice to see you here! Minette! Thank you for the intro to Zentangle and your beautiful art! I just spent a few days camping on the Gulf Islands, BC and it was phenomenal to unplug and be immersed in the creative energy of the ocean and forest. Love the word fierce…So important to stake a claim for the time we need. BC is so beautiful Pamela! Glad you had a great time! Thanks, Andrea! I love crosswords, too. I used to do a lot more of them, may need to pick it up again. Yes, there are lots of wonderful meditative arts, Reba!